Home Blog Rejection or Re-direction? It’s your choice. It can be easy to see Rejection as an ending, what if you can make it a beginning? A re-direction of your energy into your ultimate goal? Earlier this year a project I had been working on was rejected and I was over-whelmed with disappointment. It felt hard to motivate myself or find perspective. The more positive and excited I felt, the more opportunities I was offered and within days it was clear that my rejection had been the best decision, setting me off in a new more productive direction. At first you may not agree with the reasons behind a rejection, but it can help you navigate where to go next. Be prepared to review or even shelve your project completely. Sometimes we need reminding that banging our head on the same wall will not turn it into a door. 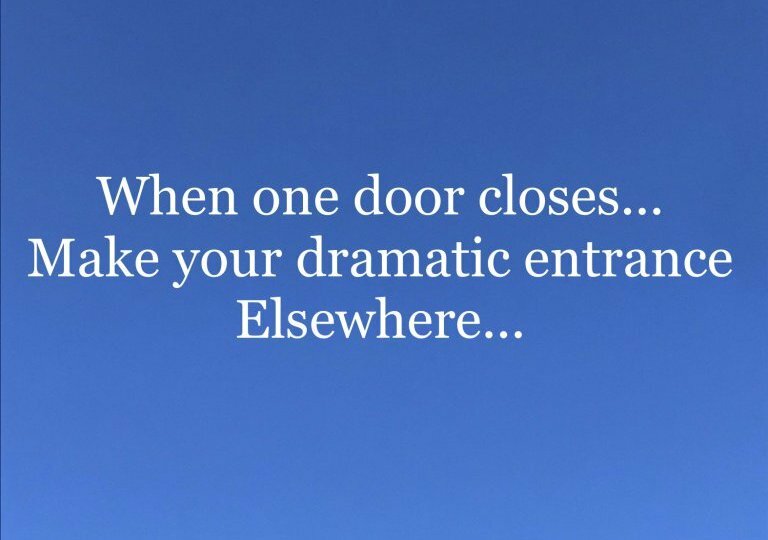 Instead, go and find your door and make your dramatic entrance.